Mangoes (Mangifera indica) is one of the tropical fruits, commonly called as "king of fruits". Pakistan is the fifth largest producer and third largest exporter of mangoes in the world. Its soil and climatic conditions enable production and market supplies of good quality fresh mangoes over a period of about five to six months. Pakistani mangoes are one of the most popular and best-loved fruits worldwide, therefore, enjoy a prominent position in the international market. Because of its excellent flavor, attractive fragrance, beautiful shades of colour, delicious taste and healthful value, Pakistani mangoes are now recognized as one of the supreme fruit in the world market. According to latest scientific research as well as of folk wisdom are known to increase the body resistance against the dysentery, cholera and tuberculosis. It is said "An apple a day keeps the doctor away", this is equally to of the mango. According to our local tradition, raw mango season with the pinch of salt quenches thirst and loss of iron in the body, which occurs due to excessive sweating during the sultry summer. Mangoes have more carotenoids than most other fruits - and that helps toward off colds and reduce the risk of cancer and heart disease. Mangoes are a great source of beta - carotene, an antioxidant which protects the body against the damaging effects of radicals which helps down the aging. They are rich in vitamin A and contain significant qualities of vitamin E and are a better source of fibre. Usage Mangoes are mainly eaten fresh, but are also used in preparing squash, jam, and other preserves and sometimes canned. Young mangoes are used in making mango chutneys and pickles “achar”. Shelf Life The ideal storage temperature for mango is 55°F. When stored properly a ripened mango should have a shelf life of 1 to 2 weeks. Varieties Mango varieties have been known for attractive colours, savoring smell, delightful taste and high nutritive value. The most popular commercial varieties - all different in colors and sizes, and each with a distinct flavour and taste - include Sindhri, Chaunsa, Anwar Ratole, Dasehri, Sonahra, Fajri, Langra, Began Phalli, Lal Badshah, etc. Health Values Mango has unique and appealing aroma and the fruit contains 10-20% sugar, an important source of vitamin A and C and contains vitamin B. Small amount of protein, Iron, Calcium and Phosphorus are also present. 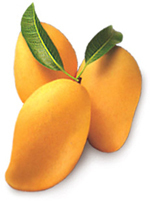 Mango grows in Punjab and Sindh provinces of Pakistan. 300gms to 450gms and plus. Kinnow is a member of Citrus family. It was developed from a lengthy hyberidization process, through the cross-breeding of two other varieties 'King' and 'Will Leaf'. It is indigenous product from Pakistan. The finest of all the citrus fruits regard this fruit rich in flavor with exquisite taste. It is easy to peel, the rind, containing numerous oil glands, comes off easily with bare hands since it is loosely bound compared to other type of citrus fruits. Therefore kinnow can be just peeled off and enjoyed anywhere, anytime. Pakistan as a nation produces about 12% and stands among the top tem citrus growing countries in the world. These fruits are grown nearly in all the four provinces in varying proportions. The popular varieties grown in Punjab include oranges, Red Blood, Mausami, Ruby Red , Jaffa , Fruiter, Malta, limes and lemons. Approximately about 60 per cent of total citrus production is comprised of mandarin being popularly know as 'Kinnow'. Quality wise, 'Kinnow' is the most important variety. It is relished both domestically and internationally for its flavour. It is golden in colour and has a thin loose skin. This variety has been obtained through the cross-breeding of two other varieties 'King' and 'Will Leaf'. Our production capacity is 1.28 m tons per season. In Pakistan the kinnow is grown under totally natural conditions to enhance the original flavour of the fruit and to preserve its fundamental goodness. Usage It is widely used for juices, squashes, jellies and marmalade. Shelf Life Once treated with proper fungicide, waxed and and handeled carefully to store the Kinnow at about 4°C. It can retain its freshness upto 60 days. Varieties The popular varieties grown in Punjab include Oranges, Red Blood, Mausami, Ruby Red , Jaffa , Fruiter, Malta, limes and lemons. Approximately about 60 per cent of total citrus production is comprised of mandarin being popularly know as 'Kinnow'. 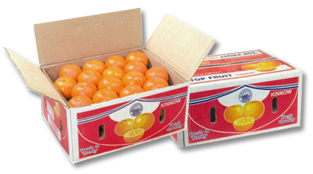 Quality wise, 'Kinnow' is the most important variety. It is relished both domestically and internationally for its flavour. It is golden in colour and has a thin loose skin. This variety has been obtained through the cross-breeding of two other varieties 'King' and 'Will Leaf'. Health Values It is rich in Fiber and Vitamin C which is important for the production and maintenance of collagen.